Growing up, Lisa longed for a fairytale romance akin to those she'd seen in movies; what the Lord gave her instead was more beautiful and real than she could have imagined as a girl. As the Holy Spirit refined and purified her understanding of true love, Steve came into her life and showed her that love, lived in daily life. In Lisa's words: The first year of our dating relationship was far from the makings of a romance movie. For starters, we began dating in December. Our hang-outs took place in temperatures below 20 degrees in a small town I knew nothing about. Our commute to this town was laden with snowstorms, and at one point took 10 hours for him. My chronic health condition took a turn for the worse that year, and for months on end, fancy dinners, fireworks, fun dates and walks under the stars where exchanged for hospital visits and sitting at home on the couch. Our relationship was a far cry from a romantic comedy. My heart ached for those butterfly moments and the “honeymoon stage” everyone talked about. Yet, this was exactly what God desired for our relationship. He desired that I submit my expectations for what true love looked like. During that year, Steve and I allowed Christ to purify us in the flame of the Holy Spirit and we gave Him the permission to take us through the trials he knew were best for us and to write our love story in His own way. After our trials slowly came to end, I realized that the winter storms of this life were not able to shake our love. God had become our anchor and our love became stronger. In November of 2016, Steve proposed to me in front of the Tabernacle at St. Paul’s Basilica in Pittsburgh during one of my weekend visits. As “Oceans” by Hillsong United was playing and a slideshow of our relationship caused tears to flow, I knew it was the moment I had always waited for. He bent down on one knee, and a sense of peace overwhelmed my heart. In the summer of 2016, during the Year of Mercy, my husband Steve were married and it truly was the happiest day of my life. I couldn't contain the joy welling up in my heart. 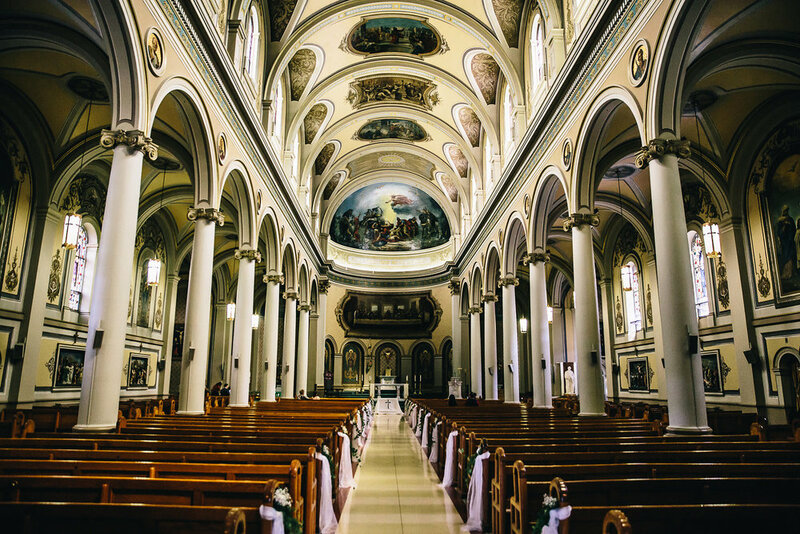 Our ceremony took place at a renaissance style church and at a hall with timeless elegance. We were surrounded by friends and family and Christ was the center. It's amazing to think that we've now been married for a year! My dress was everything I dreamed it would be, from the detailed lace to it's romantic, princess style. I found it at a charming small boutique near my house with my mom and my best friend. I had the sleeves added and they came out perfectly. However, let’s just say I had no idea walking in tulle would be so hard and that I would get GUM in it right before the reception (we cut the gum out and you couldn’t tell anything was missing because of the amount of tulle!). Before the ceremony, we decided to go the traditional route and not see each other. Our photographer Amer and videographers Anita and Michael took pictures and recorded a video of us getting ready individually before the ceremony. I had my best of friends surrounding me as I prepared to exchange vows just hours later. We had the best time laughing together and being pampered by the best makeup and hair team. Right before leaving, we stood in a circle and prayed that Jesus and the Blessed Mother would be present as we said our yeses. Once we arrived at St. Paul’s Basilica, Steve and I stood on opposite sides of the Holy Doors for the Year of Mercy and had a special prayer moment. Our photographer captured the moment as we held hands and prayed. I was so nervous and giggly knowing he was right behind the door! 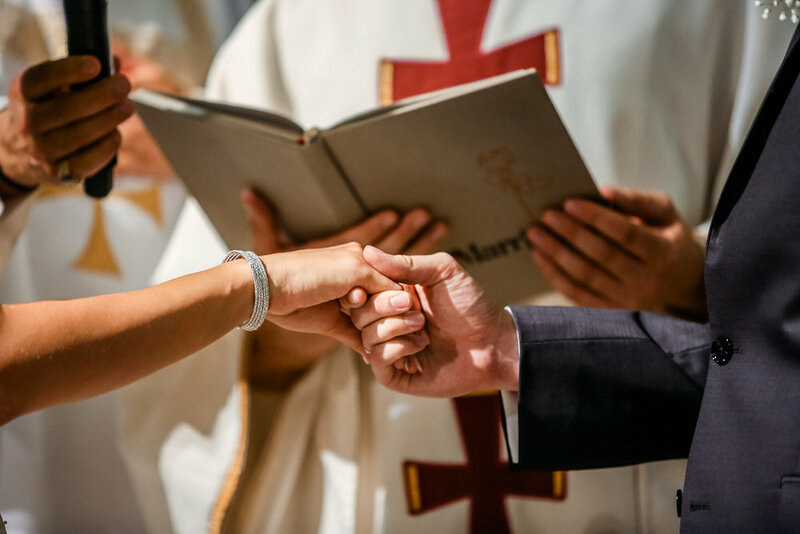 If you ask anyone in attendance at our wedding Mass, they will tell you that the Holy Spirit was present. I remember walking into the church looking down at my white shoes and tulle surrounding them thinking that this was the day I had always been waiting for. All those years of draping towels over my head as a little girl pretending it was a veil and then waiting for my beloved spouse as I grew older were worth it. I received so much healing that day from hurts and heartaches of the past, the love of Jesus and of Steve filled my heart immensely. We received a grace from the fountain of mercy and said yes to take on each other’s burden for the rest of our lives. One of my favorite moments from our wedding day is the moment we knelt down in front of the statue of our Blessed Mother to give her a bouquet of flowers. We placed the bouquet of flowers in front of her and I experienced such love in my heart I can't describe. I cried and cried as I felt her blessing our union. In that most intimate moment, Steve took his purity ring off of his finger, opened the palm of my hand and placed it inside. He didn't say any words but he didn't have to because I knew what we were both thinking: it was worth the wait. Being a Polish- Canadian and my husband a native Pittsburgher, we both implemented our traditions into our reception. Anyone from Pittsburgh knows that there must be a cookie table. In Polish culture, the parents of the bride welcome the bride and groom into the reception hall with blessed salt and bread. With the blessed salt, the parents are blessing the couple with protection and well-being. With the bread, the parents pray that the couple never encounter need or want, and if they do, that God would help them in their trial. In addition to this tradition, we had a polish DJ who played traditional polish folk music and of course, we served pierogi at our midnight buffet. It means so much to me that Steve embraces my culture and all of my Polish traditions. I chose the Old Mill and Spa for the reception because of its vintage beauty and outdoor garden setting. The hall inside is so beautifully adorned with gold framed mirrors and large fireplaces that we didn't have to decorate at all. My bridesmaid wore gorgeous wine colour dresses that complimented the gold hall colors. They served the most amazing food and had the nicest staff who checked on me periodically through the night to check if I was eating! Lisa's spiritual takeaway: As a young girl, I had no idea that a love like Steve's existed: a love so devoted, godly, passionate, yet pure. Now that we are united in love, I know that we will overcome anything together through the fountain of grace that was poured out for us on the altar. I know that that there is simply no one else that fits so perfectly with me. Steve is the most handsome, witty, funny, kind, and awesome answer to prayer that God has ever given me and I am so excited to spend the rest of our lives chasing Jesus together.